Switch up your boring ol’ spaghetti night with this bacon, basil, tomato pasta! Spaghetti is a staple in our home. I know that pasta isn’t French, per se, but it’s one of the Frenchman’s favorite comfort foods. The hubby eats it when I make it, but the red marinara sauce that is filled with ground beef, and a few extra seasonings just isn’t his favorite. He likes variety in his meals. Yeah, it’s sometimes a challenge and I can’t always keep everyone happy at every meal. Sigh. But, that’s what being a family is about. Loving each other enough to not always get our own way. 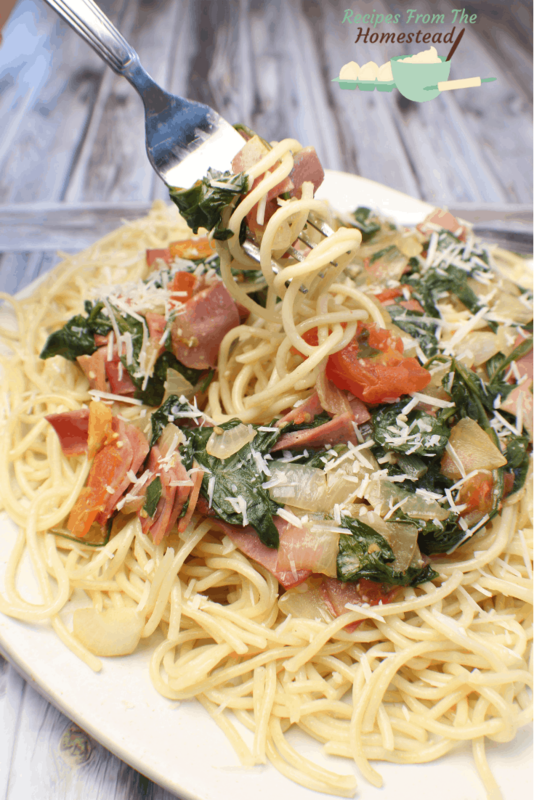 However, this bacon, basil, tomato pasta is a family favorite. I got the idea from watching the Food Network some years back, and adapted it to fit my family’s needs. It did take a few times to get the right combinations of bacon, basil, tomatoes, as well as onions and garlic for a good flavor profile. Not that any of the guys minded eating all the trials. My favorite part of this dish is how easy it comes together. Really, by the time the noodles are al dente, the sauce is done, and dinner is ready to go. 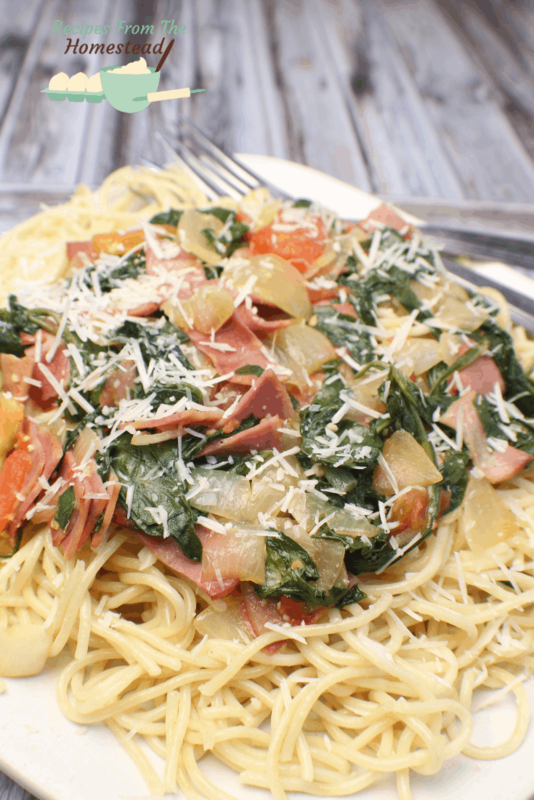 In less than 15 minutes, you can have a delicious, hearty pasta dish on the table. It’s great for the summer time, as it’s not a heavy dish. Really, though, any time of year is perfect for this bacon, basil, tomato pasta. Now, I don’t eat pork products for many reasons, mostly religious, but you could use pork bacon if you would like. Turkey, duck, or beef bacon also give this wonderful flavors and I normally go for turkey bacon, as it is the cheaper one. The amount of garlic may scare some of you, and if that’s you, feel free to cut it back. The Frenchman loves his garlic, and we all agree around here that it’s necessary in mass quantities. However, adjust it to your own personal tastes. Begin by cooking the noodles in boiling water according to package instructions. Cook until just al dente, or slightly underdone. Drain and set aside. Meanwhile, in a large, heavy bottomed pot, heat the oil. Slice bacon into pieces and add to the pan and cook through. Add tomatoes, basil, salt, and pepper to pan and cook for 5 minutes, stirring frequently. The tomatoes will soften and give off their juice. Add drained noodles to pot, and stir to combine. Allow noodles to finish cooking 1-2 minutes in the sauce. What is your favorite pasta dish? Will you try this one? Be sure to let me know if you like it! Add garlic and onions to the hot oil and sautee for 3 mintues. Add bacon to the pan and cook through.